Punti Necessari: 5600 Please note that, for now, you cannot download content from our platform directly onto a mobile device (phone, iPod, iPad, tablets...). You need to download your items onto a PC or Mac, and then transfer them onto your device in the normal way. We are working on allowing direct downloads to mobile devices but this is not possible in the current version of the platform. Sorry about the inconvenience! NOTICE: Activation key must be used on a valid Steam account. Requires internet connection.ABOUT THE GAMECall of Duty® 2 redefines the cinematic intensity and chaos of battle as seen through the eyes of ordinary soldiers fighting together in epic WWII conflicts. 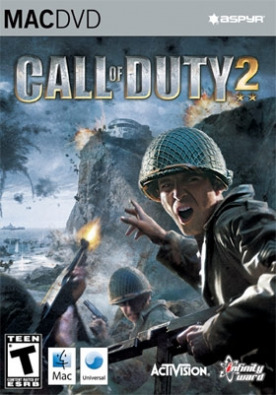 The sequel to 2003's Call of Duty, winner of over 80 Game of the Year awards, Call of Duty 2 offers more immense, more intense, more rea… listic battles than ever before, thanks to the stunning visuals of the new COD™2 engine. KEY FEATURES The #1 WWII shooter development team returns with an amazing new experience: Developed by Infinity Ward, creators of the award-winning Call of Duty. All-new, unprecedented enhancements from stunningly realistic graphics to seamless gameplay, thanks to the revolutionary COD2 engine, groundbreaking AI, and choice-based gameplay innovations. Beautifully rendered snow, rain, fog, and smoke, combined with dynamic lighting and shadows, make this the most intense WWII shooter yet. New conflicts and enemies to face: Call of Duty 2 brings you bigger battles, with more tanks, troops, and explosions on-screen, and bigger scope, with a wide range of locales and environments across the European Theater. Fight The Desert Fox across the scorching sands of North Africa as wave upon wave of tanks clash in the desert. Use rocket-propelled grappling hooks alongside your Army Ranger squad to storm and scale the cliffs of Pointe du Hoc against a relentless German counterassault, and slog through urban chaos as a tank hunter in war-torn Russia. Rely on your squad as never before: The dozens of Allied soldiers surrounding you are fully aware of the changing situations around them, and will let you know using an all-new, context-sensitive battle chatter system. They will draw enemy fire, lay down cover for you, use foxholes and moving tanks for cover, and warn you of incoming enemy troops and hostile fire. Choice-based gameplay: Play through missions in the order you see fit. Will you decide to play first as a sniper or as a tank commander? It's your call. Open-ended battlefields allow you to individualize your tactics and choose the order in which you complete your objectives. Multiplayer Mayhem: Go online for intense Axis vs. Allies team-based multiplayer action, building on the hugely popular Call of Duty multiplayer modes. SYSTEM REQUIREMENTS Minimum: Operating System: Mac OS X 10.6.8 or later Processor: Intel Core 2 Duo CPU Speed: 1.8 GHz Memory: 512 MB Video Memory (VRam): 128 MB Hard Disk Space: 4.0 GB free disk space Video Card: ATI Radeon 9600 Video Card / NVidia Geforce FX 5200 Peripherals: Macintosh mouse and keyboard Supported Video Cards Nvidia: 7300, 7600, 8600, 8800, 9400, 9600, GT 120, 320M, 330M ATI: X1600, X1900, HD 2600, HD 3870, HD 4670, HD 4850, HD 5670, HD 5750, HD 5770, HD 5870, HD 6750 Intel HD Graphics 3000 Notices: Intel integrated video chipsets (including GMA 950) are not supported. Integrated video chipsets are not supported: GMA 950 Mac Mini(2006,2007), iMac(2006), Macbook(2006,2007), GMA X3100 Macbook(2007,2008), MacBook Air(2008). This game is not supported on volumes formatted as Mac OS Extended (Case Sensitive) © 2011 Activision Publishing, Inc. Activision and Call of Duty are registered trademarks and United Offensive is a trademark of Activision Publishing, Inc. All rights reserved. Developed by Gray Matter Interactive, Inc. This product contains software technology licensed from Id Software (“Id Technology”). Id Technology © 1999-2000 Id Software, Inc. The ratings icon is a registered trademark of the Entertainment Software Association. Aspyr is a registered trademark of Aspyr Media, Inc., and the Aspyr star logo is a trademark of Aspyr Media. Mac and the Mac logo are trademarks of Apple Computer, Inc., registered in the U.S. and other countries. All other trademarks and trade names are the properties of their respective owners.